Russia denied on Saturday a German media report suggesting that it could sign a gas pipeline deal with Greece as early as Tuesday which could bring up to five billion euros into Athens' depleted state coffers. German magazine Der Spiegel, citing a senior figure in Greece's ruling Syriza party, said the advance funds could "turn the page" for Athens, which is now struggling to reach a deal with its creditors to unlock new loans to avert bankruptcy. "No, there wasn't (any agreement)," said Kremlin spokesman Dmitry Peskov, in comments made to Business FM radio and quoted by RIA news agency. "Naturally the question of energy cooperation was raised. Naturally ... it was agreed that at the expert level there would be a working-out of all issues connected with cooperation in the energy sphere, but Russia did not promise financial help because no one asked for it," Peskov was quoted as saying. During his visit to Moscow, Tsipras had expressed interest in participating in a pipeline that would bring Russian gas to Europe via Turkey and Greece. Under the proposed deal, Greece would receive advance funds from Russia based on expected future profits linked to the pipeline. The Greek energy minister said last week that Athens would repay Moscow after 2019, when the pipeline is expected to start operating. Greek government officials were not immediately available to comment on the Spiegel report. "I do not think that this would solve the problems Greece has in fulfilling the commitments of the memorandum of understanding (with its European partners)." The new government in Greece has been talking with its euro zone partners for months to try to secure aid and avert a default which could push the country out of the single currency bloc. But progress has been slow and Athens has been exploring other sources of funding. Soon after the Reuters story 'leaked out', speculation was rife that a deal would be signed early this week. Capital.gr just confirmed the deal will be signed on Tuesday in Athens, which goes to show you whenever you have official denial, it's pretty much guaranteed that something is cooking (although it remains unclear whether Russia will provide Greece with a lump sum payment). So Tsipras and his cronies, which remain defiant as creditors up the pressure and are now threatening a referendum, managed to squeeze €5 billion out of Russia to make their payments to these creditors and more importantly, to pay salaries to the bloated public sector and pensions to many retired civil servants. But all this deal does is just buy Greece and its euro partners a couple of more months of posturing. German Finance Minister Wolfgang Schaeuble is absolutely right, the deal doesn't solve Greece's problems because the underlying structural cancer plaguing its economy remains intact. And what is the biggest underlying structural problem plaguing the Greek economy? It's grossly over-bloated public sector which has grown by leaps and bounds over the last 40 years since the heyday of Andreas Papandreou as both PASOK and New Democracy kept buying votes by creating bogus jobs in the public sector. I want you to understand something, I'm not against the public sector. We need a functional and accountable public sector and I've worked at jobs in the private and public sector and seen the good, bad and downright ugly all over. But when it comes to Greece, you simply can't fathom what kind of waste is still going on there, even six years into the crisis. This is why I take a lot of what Nobel-laureates Paul Krugman and Joe Stiglitz write on Greece with a grain of salt. No doubt about it, austerity when an economy is in a depression will only make things worse, but the flip side is lending money to Greece so Tsipras and his cronies can increase public sector salaries and pensions while doing nothing significant to cut it down to a more manageable size makes no sense whatsoever. Why should creditors agree to such ridiculous terms? Also, something else Krugman and Stiglitz don't understand is the Greek economy. It's a special beast run by a few ultra wealthy families, special interest groups, and most worryingly, powerful public sector unions hell bent on protecting a system which is on the verge of collapse. When people ask you about the Greek crisis, tell them the private sector, not the public sector, bore the brunt of the savage cuts to wages, pensions and jobs. The Greek public sector continues to thrive and that is the biggest problem plaguing Greece, the gross and dangerous imbalance between its public and private sector. Over 70% of the few jobs remaining in Greece are now directly or indirectly tied to the public sector. There are close to 1 million public sector employees in Greece, just as many as there are in Canada except the population of Greece is less than one third that of Canada. So when new Keynesians like Krugman and Stiglitz, both of whom I respect a lot as excellent economists, tell you that austerity is always bad, I say "rubbish" because in the case of Greece, it's not austerity but rather the lack of proper structural reforms as well as the asinine way they implemented austerity which is the root cause of why this crisis still lingers. Every Greek with a modicum of intelligence knows what Greece needs, but far too many Greeks are still buying the propaganda of Tsipras, Varoufakis, and others in the Syriza party which think the country can continue on this path of destruction indefinitely. The need to reform will not go away after the return to the drachma. Unlike Venezuela, Greece has no natural resources in sufficient abundance to sell to foreigners and generate the hard currency needed to purchase basic goods for their population. Therefore, Greece will end up in the same position as Venezuela but much more quickly. Just a few scenarios in my mind: significant immediate rise in unemployment, rampant inflation, shortage of basic goods/foods, load shedding by DEH, no fast ferries to the islands, no Aegean or Olympic Air, foreign debit and credit cards will no longer work in Greece. Unfortunately, the average Greek has no idea what is coming. Listening to Greek television every night, this is my worst fear too, the average Greek is still either living in denial or completely delusional of what will follow if Tsipras and his cronies are allowed to run the economy to the ground. Of course, I don't blame Greeks, many of whom were sick and tired of the lies spread by PASOK and New Democracy. These two hopelessly corrupt parties have been leading the country forever and they are ultimately responsible for the precarious state of the Greek economy. Syriza is just pouring gasoline on the debt fire, ensuring Grexit as creditors maintain their big fat Greek squeeze. And as Andreas Koutras points out in his latest comment, there are very few options left for the Greek government, and all of them are bad. This is why time is running out and many Greeks are ill-prepared for what lies ahead. Russia and China will play a larger creditor role in Greece, this is near certain. However, providing funds for Athens to satiate unplayable sovereign scrip to the Troika is not at all beneficial for Russia. There will be plenty of opportunity to be viewed as a long term partner following a debt default/ forced restructuring of GR euro-denominated debt. Athens is in the pole position, yet so few understand this. As for the eurozone, everyone is confident it has turned the corner, but they're reading too much into a recovery that has been temporarily boosted by the huge decline in the euro. They should read Barry Eichengreen's latest comment in Project Syndicate, Europe’s Poisoned Chalice of Growth. He brilliantly explains why many of the underlying conditions that produced the eurozone crisis remain unaddressed. And what about Russia? 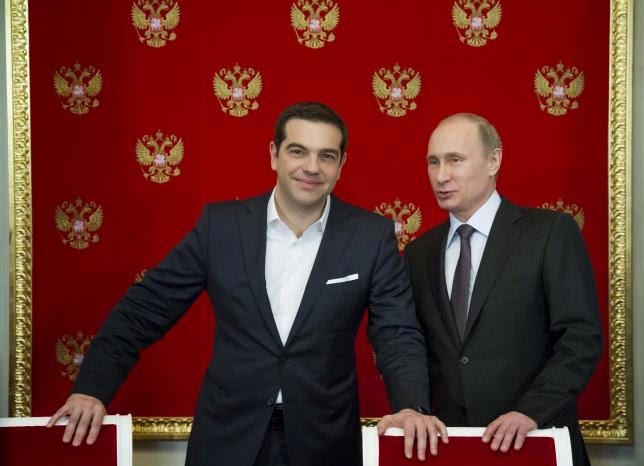 Putin can kiss that €5 billion 'loan' to Greece goodbye, and he knows it. He just wanted to send a message to the West to stop interfering with its policies in the Ukraine. He also warned Israel to stop selling arms to the Ukraine and he slapped that country in the face by providing Iran with a sophisticated S-300 air defense system, severely hindering Israel's ability to strike the Islamic Republic. And this is what should worry all of us, not the dog and pony show in Athens and Brussels. The world is becoming a much more dangerous place and these geopolitical tensions have helped boost oil prices a bit from their moribund low levels. Of course, if global deflation sets in after the China bubble bursts, watch out, oil prices and the Russian economy will sink faster than you can say "From Russia with Love." And that's when the real threats to the global economy will emerge.